What kind of learning curve should I expect? You need basic PC and print knowledge. However no matter what your level of knowledge we will tailor the training to suit, so whether the curve is shallow or steep, we will be at your side the whole way. Read some of our testimonials to find out more about the customer experience. How much does it cost to print a t-shirt or garment? Whoa, difficult question. Strictly speaking there are too many variables to give an exact answer. For instance, How big is the print? How much colour is involved? How much of that colour is solid blocks of colour? What we can say is that, because of the lack of set up problems and time, the print will be considerably lower cost than the equivalent image screen printed on a small number of shirts. How many colours can I produce using Direct to garment printing? How many do you want to produce? In truth the same applies here as with the ‘cost’ question above. Lots of variables that will affect how many come off the printer per hour. Small quick prints generate more production though so if you want high productivity then keep your designs small. Do I need to do anything to the garments before printing with a DTG printer? If you are printing with just CMYK then the answer on most occasions is no. However, if you are printing using white ink or printing onto polyester, then you will need to pre-treat the garment first. Apart from that the only thing you need to do before printing is to remember to put it on the printer! What do I do with the garment after they have been printed? Pack them, ship them and collect your money! Seriously though, you need to press them using a standard transfer press for the given time and temperature. That’s all. How does the printer know to print white ink under the colours on a dark shirt? It knows because you tell the software that you are printing with white ink. The program works out where and how much white is needed and this information is then automatically sent to the printer. Clever stuff eh? Do the prints stand up to washing? If you wash them correctly then the answer is yes. Most, if not all, modern garments carry a care label that is well within the specifications for this process. If, however, you boil or bleach them then the answer is no. 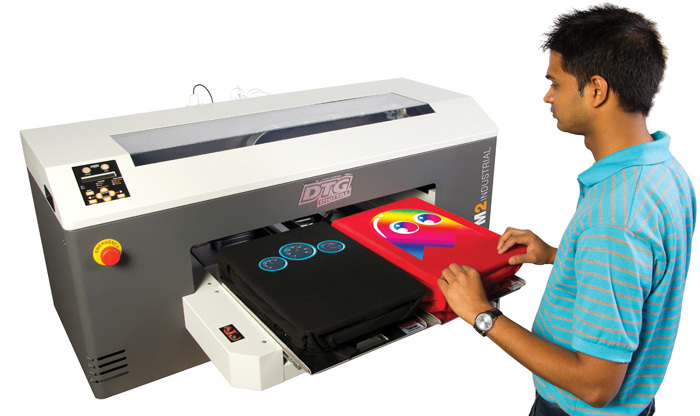 What about maintenance on a DTG printer – how much is required? The best way to answer this question is ‘little and often’ Just like any piece of machinery it needs to be looked after. How much will depend on how hard you work it. Remember though that all of our machines are built for industrial use so don’t compare them with the small printer you have at home. Can you print on items other than t-shirts and other garments? The short answer is – yes. The slightly longer one is – yes, depending on the textile. Just ask us for details, we’re always happy to help. Is there anything else I should give consideration to? What, like world peace and the environment? Actually talking about the environment direct to garment printing is a very eco-friendly way of printing. Yes, there are lots of things to consider but no more than with any business. Just contact one of our friendly advisors with any questions you have and they will be happy to help. Apart from that, just enjoy watching your machine make money and producing quality imagery that will make your clients delighted.